Perplexing to think of any director – least of all one that does his best at finding the right subjects to corroborate a certain perspective – turning to this particular case study to fuel the incentive of an anti-death penalty film. Then there is a little voice that seems to chime in as we progress through the details: maybe Herzog is seeing something we are not yet picking up on. The film is a thorough restructuring of a triple homicide that occurred in Texas in 2001, in which Perry – along with an accomplice, Jason Burkett – murdered high school peer Adam Stotler, his good friend Jeremy Richardson and mother Sandra in order to steal an expensive car from the family’s garage. By investigative measures there is a remarkable sense of access to specifics; old police footage of crime scenes is incorporated in eyewitness reconstructions of the discoveries of bodies, all while relatives of the deceased regard the fallout of their losses. It is particularly sad when the emboldened filmmaker presses on Adam’s sister for insight into her ongoing grief; with the loss of two relatives to murder (and just on the heels of other family tragedies), she no longer owns a phone. Bad news doesn’t travel as far if there is no way to be reached. 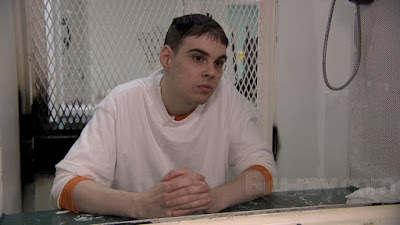 Specifics are colored further by the culprits – by Perry, who claims (perhaps simply in a last-ditch urgency to avoid injection) that it was his accomplice who put the whole plan together, and by Burkett, who is serving a life sentence for his own part in the murders. As they speak and additional witnesses are sought for their own insights into the homicides that haunt them, an unspoken context fills the screen in the quiet moments: few of them are happy that Perry’s life is about to end. How can that be, especially when there has never been a doubt as to the depth of his wrongdoing, or no sense of remorse for his crimes? The key may come down to a feeling that Herzog hopes to create as his camera lingers in the presence of his subjects. It is easy to say you are in favor of that sort of punishment when everything remains theoretical, but what does it accomplish to anyone when another life is taken by the government? Does it bring the victims back, or offer their loved ones a stroke of comfort? By placing the argument in the limelight of the Texas justice system – indeed the most hyperactive of all capital punishment laws – “Into the Abyss” struggles to come to terms with these details in an example where there is little time to contemplate or change one’s mind, because inevitable another inmate is being walked down the hall as they speak. The impact is never attributed to the logic of scenarios or even discussions about the law itself. Herzog’s feelings are well-known (“capital punishment is very old testament – the Wrath of God.”), but his intention is simply to observe, to hear and then reveal buried feelings, sometimes inadvertently. Consider a dialogue he shares with Fred Allen, a former police officer who once championed the initiative of Texas’ aggressive punishment laws; after being part of hundreds of executions and having to stand there and watch on as people left this world, something deep inside snapped, causing him to abandon his career. What caused the shift? He doesn’t explain. But he doesn’t have to – the conventional wisdom is that in high amounts of moral ambiguity, sometimes there is nothing left to say beyond “I’ve had enough.” Seeing the director’s subjects quietly concede these realities calls to mind any number of human tragedies – like the massacres in Sudan, or the Holocaust – and how the human mind attempts to rationalize them. For those who are complicit in another human’s death, at what point does one detach from their own moral compass and feel content to look the other way in a wilderness of cascading violence? “Into the Abyss,” is simple, sobering and brutal in this distinction, a mark of tremendous insight that plays like another notch in the social dashboard from which Werner Herzog continues to find his inspiration. Once the auteur of a handful of dramatizations about the discord of man in nature, now he is at the forefront of a career of perceptive documentaries. His “Grizzly Man,” a great film, told the story of Timothy Treadwill, the deceased naturalist who went to live in the Alaskan wilderness with grizzly bears before eventually being eaten by them. “Cave of Forgotten Dreams” deals with a cave of 30,000-year-old pictograms discovered in the south of France with astonishing insight. And his “Encounters at the End of the World,” one of the most haunting and exquisite films I have ever seen, discovers the identity of people living in the harsh terrain of the Antarctic and the wisdom they hold dear. As you assemble these opuses together and contemplate their ideas, remarkable patterns begin to emerge: they reveal the identity of a man who is fascinated by the extremes of civilization, and who will go to any lengths to pierce the membrane between their mystery and meaning. If the subject of the death penalty provides similar challenges, then it is little wonder that a story this insurmountable reached his awareness now, when the age of information continues to advance at a leisurely pace while a penalty system from the dark ages remains unmoved on the social barometer. But there are intellectual challenges that come with this suggestion, especially in a documentary. Because facts do not benefit either side of an argument that is created by political and religious feelings, Herzog requires his audience to abandon their search for logic and simply read between the lines. Some might find that difficult given the informative nature of this genre – if emotional responses is what we are asked to provide, why not just get them in a dramatization where feelings are more fair to manipulate? Perhaps it is because the director sees some level of purity in the truth that it makes his subject so pertinent in this sort of investigation. Michael Perry and Jason Burkett never emerge as sympathetic people, nor are they ever asked to be forgiven for their crimes – but in a key moment when the camera visits Burkett’s father in the same state prison that houses his own son, how is it not possible to assume, just from gut feeling, that a system meant to protect us is also capable of breaking us? There is a key shot in the film that is disquieting in its simplistic power. As Herzog plods along with a line of questioning about the steps of a lethal injection with an expert on the subject, the camera cuts over to a nearby field of crosses, each engraved with a number instead of a name. This is the site of all those who are killed by the state, a cemetery of nameless gravesites that grows at a rather frenzied pace; dozens will become hundreds, hundreds will become thousands. What does it say about our humanity that we exist in a persistent duel against one another, reacting with one crime by committing another while providing it legal justification? Few of us will ever find an answer that aligns with our basic ideals, but in a time when civilization advances and its systems erode or remain stagnant, the necessity remains to ask such questions.